Forget what anyone may have thought, or be thinking now, about the late George H.W. 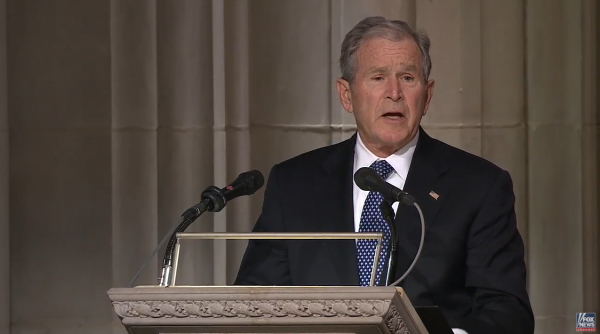 Bush as the nation said goodbye to the 41st President, and instead think about how he was remembered by his son, George W. Bush, himself the 43rd President, at funeral services Wednesday at Washington National Cathedral. In a church filled with VIPs including President Donald Trump and his four predecessors, current and former government officials, the eulogy delivered by the son separated the father from the office he once held. It was the kind of goodbye that perhaps every man would hope for from his children. Those are not the remarks one hears about the head of state, but the head of a family. There were moments of humor, and lessons about character. Those are lessons that presidents may not pass along, but good fathers do. In the days since his passing, the 94-year-old one-term former president has been recalled for many things, from leading the nation during the Gulf War to disappointing his supporters by failing to live up to the promise of “no new taxes.” Those are conversations for another day. His longtime friend, former Sen. Alan Simpson, recalled the late president as “The most decent and honorable person I ever met.” He was described as loyal to his family and friends, and faithful to his late wife, Barbara, who passed away earlier this year. Whatever faults or failures he may have had, “Bush 41” was one of the last of “The Greatest Generation.” A combat pilot, shot down over the Pacific, he was the last WWII veteran who ever served in the Oval Office.